The first tower on this site was built in 1826 close to the busy port of New York City. 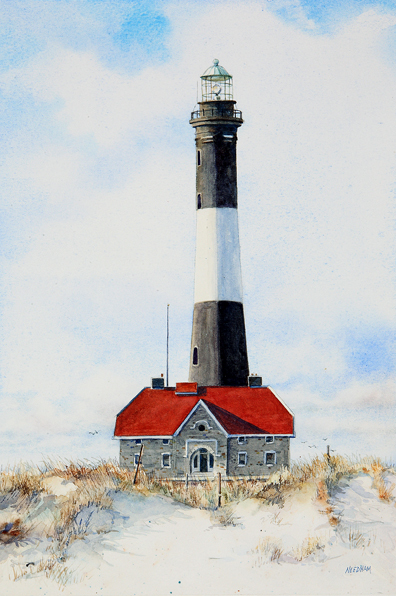 Unfortunately the tower was only 70 feet tall and widely believed to have provided inadequate warning of the dangerous shoals that lie along the coast of Fire Island. After the freighter “Elizabeth” ran aground in 1850 the Lighthouse Board authorized the construction of a new tower on the site. When the construction was completed in 1858, the black and white striped beacon stood at 180 feet and it’s flashing light was visible up to 25 miles out to sea. The flashing light earned the lighthouse the affectionate nickname “Winking Women”. Decommissioned in 1974 the tower has since been restored and relighted by a local preservation society.